Meeting the requirements outlined in the Secured by Design Homes Guide 2016, the H300-2 horizontal post box is the smart investment for any mixed-use building, student accommodation development, apartment block, or shared office environment. 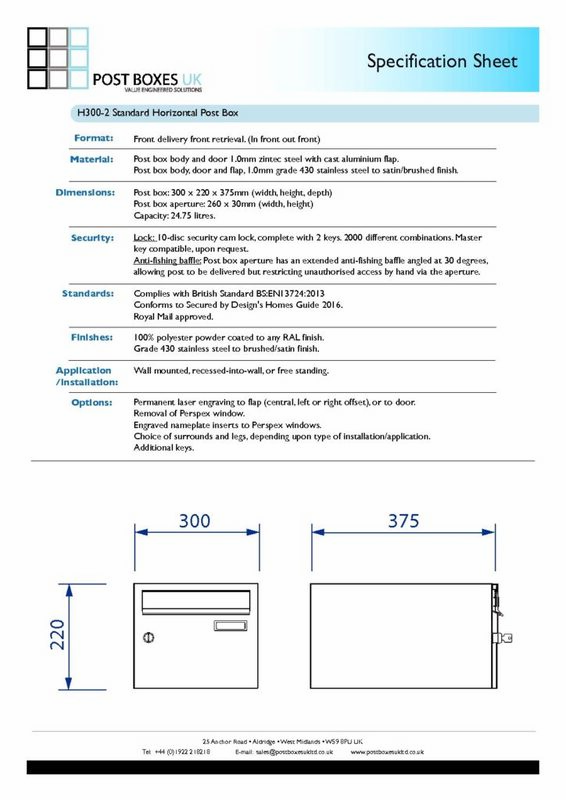 With a total capacity of 24.75 litres and dimensions of 300 x 220 x 375mm (width, height, depth), it can easily accommodate large volumes of post, including A4 size documents, without taking up valuable floor space. Post Boxes UK can configure the H300-2 letter box to complement any indoor or outdoor space. We regularly design and install mail banks with over 200 units and take care of every detail from design to delivery. Highly versatile, the H300-2 steel mailbox can be installed as a wall mounted unit, a wall recessed unit, or a free-standing unit with support legs. We currently offer over 200 different RAL Classic colours and high end finishes for the H300-2 multi-unit mailbox. To comply with Building Control and Fire Regulations, Class 0 Flame Retardant / Fire Resistant paints are available, and can also offer multi-colour mailbox banks for creative environments. We aim to deliver and install your customised H300-2 mailbox bank within 4 weeks of your confirmed order. Lead times vary depending on the project size, location, and specifications. Please contact us to discuss your project. The H300-2 communal letter box is manufactured from either 1mm electro-galvanised steel or satin stainless steel. It is weather resistant and suitable for indoor and outdoor installations. To give your H300-2 post box a smart and professional finish, Post Boxes UK offers a variety of finishing surrounds and trim options. These include 2mm and 20mm casing surrounds for wall mounted and freestanding units, and 20mm / 40mm recess trim surrounds that frame recessed mailboxes like a picture frame. Post Boxes UK offers a choice of support legs for H300-2 freestanding mailboxes such as pedestal legs, side support legs, and combinations of the two for wider mail banks and larger installations. 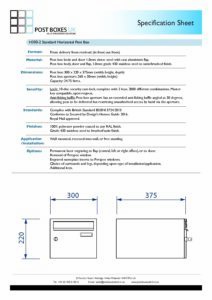 The EN13724 recommended height for freestanding mail banks is 1800mm from the finished floor level, although we can manufacture support legs to meet your exact specifications. The H300-2 mailbox for apartments can be customised to complement every building with our numbering and identification service. Engraved nameplates, laser etched numbers, identification codes, and business branding can be added to your post box bank with ease. We have most Microsoft Word Fonts, and the H300-2 model offers numerous customisation areas. High-quality Eurolock non-mastered cam locks come as standard with all H300-2 postbox models. Should you need a more robust locking solution, we can provide it. Post Boxes UK currently stock a huge range of security solutions for this multiple occupancy post box including combination locks, digi-locks, RFID locks, and master keyed suites. Please contact us for recommendations. Replacement keys and locks are available for all H300-2 letter box models. Post Boxes UK also offer discounts for bulk orders and upgrades or those who wish to improve their current locking systems. As a Secured by Design Mailbox, the H300-2 post box fully complies with the Homes Guide 2016. It is EN13724 compliant, it has an anti-fishing device, of robust construction, and it is specifically designed to prevent tampering and unauthorised access. The premium mailboxes in the H300-2 double capacity range are safe, stylish and secure. A popular choice for high-rise apartment blocks, shared commercial buildings, and communal office environments, they have a modest profile of just 220mm high, yet they can accommodate large volumes of mail.